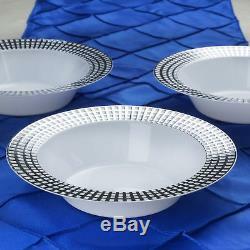 7.5 wide 12 oz Round Plastic Serving Bowls with Rim. Additional Great Discounts at Checkout! Watch your decorating possibilities come into full bloom with disposable tableware from Leilani Wholesale! Additional Information: Each bowl measures approx. 7.5" wide x 1.5" tall. Additional decorations are not included. This bowl is not dishwasher or microwave safe. The colors of products when viewed on your computer monitor may appear different than the actual color of the merchandise. Dye lot variance of 1 to 2 shades is considered normal. To minimize color variances, we recommend that all items used for one party be ordered at the same time. Your satisfaction is very important to us. Used/unsealed items will not be accepted. If you can't find the answer to your question, under Did we answer your questions? Mailing labels are printed according to the info provided on the checkout. Please be sure to provide accurate and up-to-date information. The item "12oz ROUND PLASTIC Serving BOWLS with RIM Party Disposable TABLEWARE WHOLESALE" is in sale since Tuesday, May 15, 2018. This item is in the category "Home & Garden\Wedding Supplies\Tableware & Serveware". The seller is "leilaniwholesale" and is located in La Puente, California. This item can be shipped to United States.